Eede, the Netherlands – Xeikon, a market leader in digital colour printing technology for the labels and packaging as well as the graphic arts printing industry and a subsidiary of the Flint Group, today reported that it has qualified Ahlstrom-Munksjö WALLSTAR DIGITAL® nonwoven wallcovering media for use on Xeikon digital presses as part of the alliance between the two companies. WALLSTAR DIGITAL® nonwoven wallpapers have been specifically developed for digital printing technologies, they guarantee excellent homogeneous print results and are also PVC-free. The range features smooth, structured, coated and non-coated substrates, from 110gsm to 180gsm, that ensure very easy handling and excellent dry stripability. Ahlstrom-Munksjö also reports high customer satisfaction, especially regarding the soft-touch feeling. The latest addition, the BR9708, is the only matt fibrous option on the market. It opens up a whole range of new applications and design opportunities for Xeikon customers and prospects. The long standing cooperation between Ahlstrom-Munksjö and Xeikon intensified last year when the non-woven manufacturer and printing specialist worked together to qualify a range of papers for Xeikon presses. This includes Xeikon’s Wall-Decoration Suite. It enables cost-efficient production of high-quality wall decoration for commercial, retail and residential purposes. 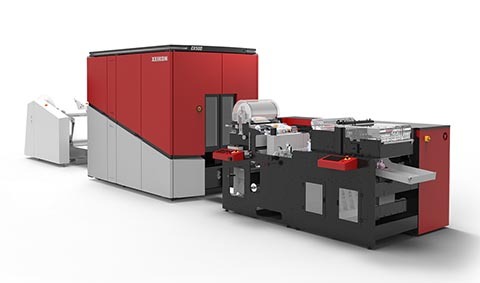 It consists of five major components: a Xeikon Digital Press, a dedicated workflow, application-specific toners, process optimization tools and pre- and post-press solutions. “We have seen an excellent 2018 performance of our Wall Decoration segment, both in terms of production volumes at our existing customers and new installations of Xeikon production lines in the field,” says Dimitri Van Gaever, Business Development Manager, Xeikon. Both Xeikon and Ahlstrom-Munksjö are displaying their expertise and products this week at Heimtextil January 8 to 11, 2019 in Frankfurt, Germany. Xeikon will be located in Hall 3.0 booth J65. For further information about the use of WALLSTAR DIGITAL® media with Xeikon digital presses and the Xeikon Wallcovering Suite, visit www.ahlstrom-munksjo.com and Xeikon’s Printmedia website www.printmedia.xeikon.com.